Hello! It was back in June that we last posted here. At that point we were about to embark on our first E3 trip with a very early build of the game. Needless to say a lot has changed since then! Player physics have been tweaked, we’ve redesigned a ton of grindable assets and we’ve also settled on the final modes of the game (there are four in total!). In this post we want to concentrate on the most important game mode, Career, as it helps you unlock both Spots Mode and Rad Mode as well as preparing you for the do-or-die, risk it all, Daily Grind. In Career you are confronted with the task of completing 50 Levels split across five stages: Urban, Junkyard, Port, Base and Neon, with 10 levels per Stage. The levels are split into ‘Amateur’ and ‘Pro’ to help the player skill-up as they progress. 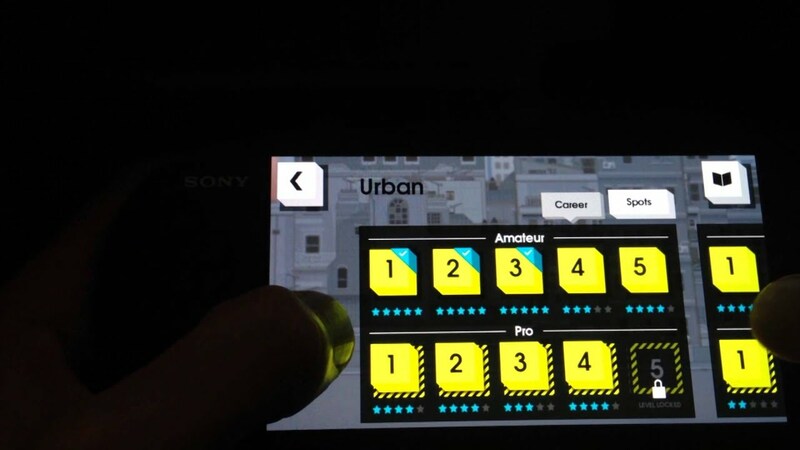 The Amateur levels follow a linear path — complete Urban 1 to unlock Urban 2, Complete Urban 5 to Unlock Junkyard 1. However, merely completing a level is least of your worries! Each level has five challenges, two of which are always score challenges, one based on overall score and a second based on your combo score. The remaining three challenges revolve around collectibles, performing certain tricks and playing the level in a different way (e.g. ‘Don’t grind in the first 300 Meters’). If you’re a super boss and if you have the uber skill, in some levels you can complete all five challenges in one go! So what’s the incentive for completing all five challenges? Well, I’ll tell you. Every time you unlock all the challenges in Amateur you unlock the corresponding Pro level. Unlocking Pro levels is not a linear journey — it’s up to you complete all those Amateur challenges to feel the wind in your hair (and the concrete in your face) as you step up to Pro Mode. Pro levels take what you learned in Amateur and ramp it up to epic proportions. With longer grinds, bigger gaps and loads more obstacles, these levels will skill you up, and you’ll notice your scores improve exponentially as you begin to nail your combos. This, along with Perfect landings and Perfect Grinds, is the key to High Scores. Each Pro Level has its own five challenges. Your mission is to complete the remaining 125 challenges in order to unlock Rad Mode, the super difficult mode that we’re going to keep under wraps for now! If none of this has made sense, I suggest you watch the video at the top of this blog post, in which John explains everything above but with run-throughs, level select screens and a few face-plants for good measure. Keep an eye out for the next two videos explaining Spots and the Daily Grind, and get yourself over to our YouTube Chanel where you can see the first in the series of these videos on Controls, Tricks and Spins! Finally, while you’re here, you may as well take a look at our new teaser trailer too! Looks like a neat idea. On my radar now for sure. Coolio… I’ll probs get it.. cause of the lack of skating games. Looks totally awesome! Will definitely be getting this for sure! I’ll buy it if the price is right. i hope this game is out soon and its only $10. I’m really excited to give it a go! Looks like a lot of fun but I wonder how much?? Me and skateboarding games, we’re like this. *crosses index and middle fingers* I’m definitely looking forward to checking this out. @Zionine Yes, that exactly! Or even if they put any of the Skate games onto vita (now that there are 2 analog sticks)…. Hi all! Thanks for comments, glad you’re looking forward to playing! I can’t give details on price yet :( but as soon as I can we’ll be tweeting it all over the place! We’re in the final throws of Dev at the moment, so hopefully we’ll have a release date soon! Maybe this could be interesting but if there is a demo that could help. I love your voice! I can’t wait to purchase this game! Reminds me so much of tony hawk pro skater on gba which I played endlessly! Thanks! It’s not my voice sadly, it’s John’s I’ll let him know you like it though! Hey, we’ll be giving release info very soon and posting on the blog as soon as we know! It’s told to be in the $5-$7 range, which I’m all for anything that’s not in strictly $5 increments. I saw you were responding in comments but no red name, be sure to do that. Visibility exist for a reason ;). Looking forward to the game. File size estimate? 1mb, 10mb, 100mb, 1gig? Something rough. Release when your ready we want a good game. i sworn this was for ps3 aswell and not just the vita ? if so then bye bye. Glad you like what you see! Keep an eye for more videos as we get nearer to launch! hmmm okay. well if i get ah vita i def want this. so bye bye for now but not forever.